Brexit is beset by problems with little or no hope of what is next. “Lawmakers seeking a way out of the country’s Brexit morass on Monday rejected four alternatives to the government’s unpopular European Union divorce deal that would have softened or even halted Britain’s departure,” the Associated Press (AP) reported after the British Parliament rejected a new wave of Brexit proposals earlier in the week, continuing the years-long real-life political drama. “The result leaves May’s Conservative government facing difficult and risky choices. It can gamble on a fourth attempt to push May’s unloved deal through Parliament, let Britain tumble out of the bloc without a deal, or roll the dice by seeking a snap election to shake up Parliament,” the outlet would later continue. However, on Friday reports started appearing of Prime Minister Theresa May [Conservative] concerning doubt around her making another appeal to the European Union (EU) for another delay of the United Kingdom Brexit process. Unfortunately for Prime Minister May and the Conservative party at large, there doesn’t seem to be any support within the EU for their preferred extension date of June 30th. Despite the public disapproval of any extension, sources in touch with CNN doubt whether or not leaders in private would actually refuse to grant the UK an extension at the emergency EU summit on Wednesday of next week in Brussels. Donald Tusk, the current EU Council President, is said to have offered a year-long extension according to sources. The offer would be shortened if the UK agrees to a withdrawal agreement during that time frame, but could only be offered if the country provides a clear path out of gridlock. Late Friday night British Broadcasting Corporation (BBC) reported that ongoing conversations between the Social Democratic Labour party and Conservatives are ongoing to find an agreeable proposal prior to the EU summit on Wednesday. Shadow Brexit secretary Sir Keir Starmer [Labour] aired his grievances with the Conservatives approach stating his disappointment in their refusal to consider changes in wording to the currently arranged deal. At the present moment, the UK is slated to leave the EU on April 12th. However, as negotiations and delay requests continue, the more unlikely it seems the deadline will remain where it stands. In fact, Financial Times reported on what could be the least troublesome way forward. Senior MPs in the Conservative and Labour parties think that another referendum is likely to be the only way forward because the prime minister’s Brexit deal has been rejected three times by the House of Commons. With the Tories desperate to avoid a general election and Labour striving to keep its coalition of Leave and Remain supporters together, an increasing number of MPs are concluding a new plebiscite should be the route out of the parliamentary deadlock — despite the potential backlash from people who voted for the UK to exit the EU in the 2016 referendum. 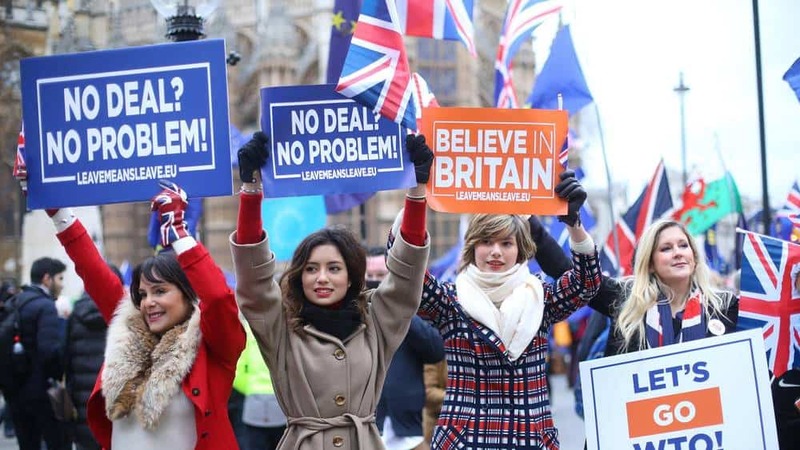 Throughout the past several months, citizens of the United Kingdom have demonstrated in support of a second referendum, which could save the country from further Brexit chaos. Those opposing the UK’s current relationship with the EU are against another vote, due to the likelihood for an overwhelming victory for the ‘Remain’ contingent.